The family claim that the song has borrowed elements from Marvin's Got To Give It Up and Robin had sought declaratory relief to deny suggestions he had plagiarised it. But according to The Hollywood Reporter, Marvin's family then issued a counter claim to EMI - now owned by Sony/ATV - for allegedly failing its obligation to protect Gaye's back catalogue. Digital Spy has reported that the family, who claimed EMI had granted rights on Blurred Lines so as not to put a stop to its high sales figures, has reached a settlement with Sony/ATV. The settlement protects the label's impartiality over the copyright of both artists' work and will stop them being dragged into the ongoing case between them, although they may have to go to court to explain to a jury why they decided Blurred Lines was not substantially similar to Got To Give It Up. The terms of the settlement have not been made available. 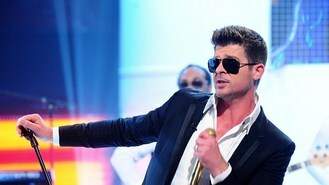 Blurred Lines was named the best-selling single of 2013 in both the UK and the US.